The genus Schomburgkia has about 22 species from South and Central America and we have two of them in flower this week. 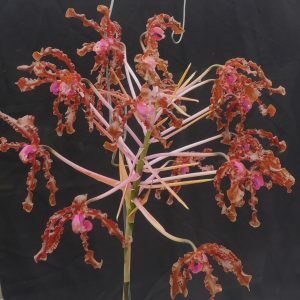 Yesterday we had Schomburgkia splendida and today we have Schomburgkia lueddemanii. 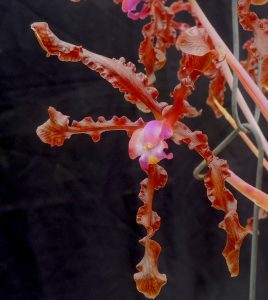 This is a larger growing species with larger flowers but a similar theme of twisted brown petals and sepals and a pink lip. We have had Schomburgkia lueddemanii for eleven years now and this year it has produced two majestic spikes each with 16 flowers. The species is found from Venezuela to Costa Rica and is found in hot lowland forest. As a result it enjoys good light and high temperatures and we grow the plant in a large basket hanging high in Warm Americas. We find it does enjoy being kept well watered especially in the summer.